SCB's Marine Section rises to challenge of saving Mexico's critically endangered vaquita. ©CEDO Intercultural: In Our Hands: a vaquita calf that was found and brought to CEDO Intercultural in 1994. 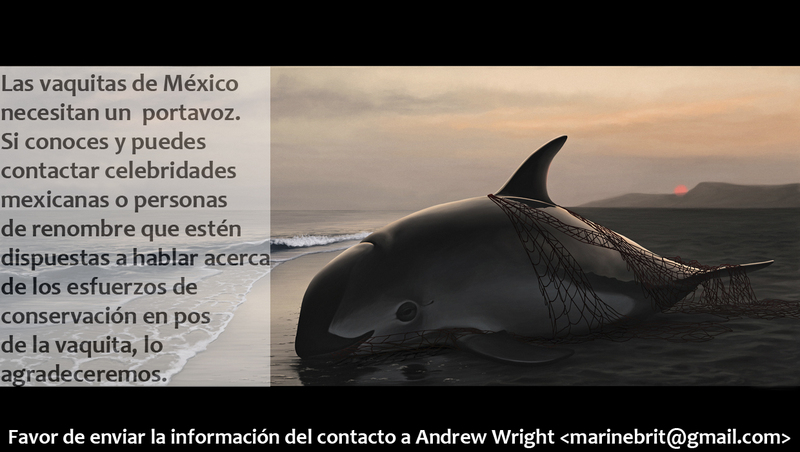 Critically endangered vaquitas in Mexico need our help finding a spokesperson. If you are interested in contributing to this task, click HERE to see the info in English or HERE for Spanish. New population estimates are out for the vaquita porpoise, and the news is not good. While efforts to reduce the catch of vaquita in the shrimp fishery have been moderately successful, increasing Chinese appetite for the swim bladders of the totoaba (an endangered fish in the same area) has resurrected the now-illegal fishery for that species, substantially increasing the death toll of the vaquita once again. As a consequence, the number of vaquita have fallen by over 50 percent in just two years to around 97 animals, with only 25 females estimated to be capable of producing offspring, according to a report from the Mexican government's vaquita conservation committee, which included the new population estimates. This is obviously not good news for the ‘little cow’, which now faces extinction squarely in the face. Despite the apparently bleak situation, there is actually much to be positive about. Firstly, the new abundance estimate has been publicised through various news outlets (e.g., including this article in the Guardian Online), providing a much-needed spotlight on the species. This coverage has introduced the world to this pretty, tiny porpoise with six fingers in each flipper and natural black lipstick. Efforts to reduce the accidental catch of vaquita in the shrimp fishery have been moderately successful. Next, there is already an area set aside with fishing restrictions in place to protect the vaquita in their extremely small range in the northern Gulf of Mexico. Complimenting this there are new types of fishing gear available to reduce the risk of catching the vaquita in the legal shrimp fishery outside of the reserve that supplies US kitchens. But there is considerable hope here too. The total costs are actually relatively low, being estimated at around $50-60million, with some ongoing investment on the enforcement side. This figure may not sound all that low, but it is less than the sum that a top actor might expect to take home for making a single movie. Mexico has been responding positively to the crisis and promises improved enforcement and faster paced solutions to replacing vaquita un-friendly gear with vaquita-friendly gear. Recognising that international support by contributing funds re-enforces these actions, the Marine Section of the Society for Conservation Biology has risen to the occasion. At the 3rd International Marine Conservation Congress, held in mid-August in Glasgow, the Marine Section pledged $5,000 to fundraising efforts. The Section also challenged other non-profits with marine interests to contribute in kind, noting that many have thus far remained unengaged. News followed last week that the Animal Welfare Institute has taken up the challenge, as the small US-based organisation has added their pledge of $1,000 to the pot. The need for greater international awareness and involvement has been highlighted by the delay by the Mexican government of their expected announcement regarding implementation of the recovery plan recommendations by three weeks at time of writing. Thus the stage is set. Time is ticking for the tiny, boat-shy porpoise that the world has only just learned about. But a quick response may yet save this very unique, very pretty and very beleaguered animal from following the baiji into the history books. The Marine Section has also partnered with The Marine Mammal Center to administer public donations. If you wish to donate to fundraising efforts to in support of the enforcement actions needed to save the vaquita, please click here. No contribution is too small. If you are an NGO that would like to step up to the challenge, please send an email to Andrew Wright (marinebrit (at) gmail.com) for more information. Since the end 2012, when SCB Marine partnered with the European Cetacean Society and the Society for Marine Mammalogy to write to the Mexican Government about the vaquita (see here), the only changes have worsened the situation. Lack of enforcement of the vaquita reserve has been combined with a resurgence in illegal fishing for the endangered totoaba throughout the region over the last couple of years. The totoaba are taken only for their swim bladders, while the rest of the body is discarded. These bladders are dried and illegally shipped mostly to China (more info on that is available here). The latest CIRVA report from July 2014 made it clear this resurgence had accelerated the vaquita decline and reduced the population to fewer than 100 animals. The Mexican Government immediately announced that they would respond to the recommendations made in the CIRVA. And the world waited. Promised announcement dates came and went, and the season for legal shrimp fishing, which has been a driver of the long-term vaquita declines, opened while there was still no announcement. SCB Marine, in cooperation with SCB LACA, decided to act and started gearing up the machinery for another letter urging action. Unexpectedly, just as the letter was being finalised, the Mexican Government announced that it would indeed be taking action. And just in time for Christmas. Seeing an opportunity to be encouraging, SCB Marine and SCB LACA reworked the letter with SCB LACA, supporting the ban while noting several improvements to the plan. The new letter was ultimately sent to responsible Mexican officials and submitted directly into the Mexican regulatory process for the proposed ban during the open comment period (available here in both Spanish and English, with the regulatory responses here and with relevant sections in English here). Despite the fact that some concerns remained (especially regarding the allowed corvina fishery), the proposal was ultimately successful (available here with supporting documents here, with English translations of the agreement and the supporting docs here). Signed into force on the 17th Feb (see here, Spanish only), the agreement was launched in a press conference on the 27th Feb, 2015 in Mexico City (English translation available here, and see here for more information). Originally supposed to come into force on the 1st March, 2015, it appears that the ban will now not take force until 1st April. Thus, while this two-year gillnet ban is an extremely welcome development, it comes after nearly one full additional year of fishing, which is expected to have pushed the vaquita even closer to extinction. The enforcement of the ban (which remains uncertain) will buy time to develop long-term solutions. To that end, SCB Marine and SCB LACA continue to work with many other governmental and non-governmental agencies seeking to find those long term solutions. Financial donations to aid conservation efforts and outreach can be made to the fund SCB Marine has contributed to at The Marine Mammal Center. In May 2015, SCB asked China to block illegal sales of totoaba, which threaten persistence of vaquita porpoise. More information can be found at this SCB Global Policy page. Finally, if you would like to contribute in a more active way, please contact Marine’s Policy Officer Andrew Wright (marinebrit (at) gmail.com). We welcomed aboard these new partners in our efforts to save the vaquita and explore new conservation outreach options.